There was once a time that Splash Back’s were only a practical thing used to protect the wall behind the Hob, Sink and other practical areas. With the variety of materials and finishes available today Splash Back’s are becoming a design feature. 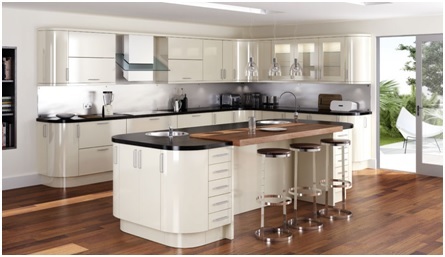 A quick and economical way to give your kitchen a new lease of life! Below are positives and negatives for different materials that can be used for your kitchen Splash Back’s. Comes in sheets of flat steel and can add an industrial feel to your kitchen. Positive – Easy to clean, hard wearing, high level of heat resistance and defiantly an affordable choice. Negative- If treated incorrectly this material can show it’s age. Tiled Splash Back’s are a popular choice, as they offer versatility, practicality and style. Thanks to advances in manufacturing, ceramic and porcelain tiles can be produced to resemble natural wood and stone, but with none of the associated performance challenges. The tiles are resistant to scratches, heat and water, and are generally reasonably cheap and easy to install. While they are durable, should a tile become chipped or damaged, you simply need to remove it and lay another, therefore making them very easy to maintain. Positive- Easy to clean, available in all shapes, sizes and colours allowing for a lot of creative freedom. Negative- Tiling grout can quickly become dirty and requires regular cleaning. Generally installed as a single seamless pane, glass can create a smooth, streamlined and sophisticated look in the kitchen. Negative- If going for a colour, once installed changing can be difficult but not impossible if you decided it’s not for you. Also known as quartz, this stone is created by mixing crushed Quartz and resin together. Negative- Must be installed by a professional, DIY is not recommended with engineered stone! A general favourite for Splash Back’s and one which works as well in a traditional kitchen as a contemporary one. Positives- Very easy to clean, very hardwearing, versatile, comes in a variety of colours and each piece will be unique. Negative- Will need sealing to prevent staining and can be more costly. A cheaper alternative to Quartz and Granite, laminate can come in all types of finishes to simulate real stone or wood. Hopefully this information we have provided is helpful for you when you come to picking your new Splash back’s. For more information or advice on Splash Back’s or any other home improvement, we have a professional team of designers who are happy to offer you friendly and experienced guidance, so give us a call on 01623 515793. We look forward to hearing from you!